Take off baby's arithmetic power! Baby do math. Training baby math in a happy way (Addition and Subtraction less than 10/20). Baby do math and win the score, then go to stickers’ wall to play. 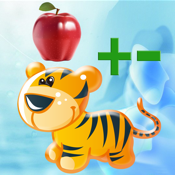 We include 108 stickers in this app, including animals, birds, fishes and even paper-cut paintings. Enjoy your happy time; search us with “tiqiaa” or “tianjia” in app store.